LAS VEGAS, NV, USA, July 31, 2017 /EINPresswire.com/ — Meeting face to face in showrooms will always be an important facet of building lasting relationships between manufacturers and interior designers. Steelyard, the industry’s most comprehensive online platform for helping interior designers discover and specify new products wants to make that process even easier. Attendees at this week’s Las Vegas Market who are looking for the furniture and home décor manufacturers that are the most eager to grow their relationship with the trade can simply turn to Steelyard for guidance. In the Market Guide for LVMKT 2017, Steelyard has showcased 25 of its top designer-friendly vendors exhibiting this week at Las Vegas Market. This list covers a wide range of product categories from furniture to art and accessories featuring top brands including French Heritage, Noir, Oly Studio, Phillips Collection, Sunpan Modern Home and many others eager to engage interior designers. For nearly two decades, Steelyard has supported the interior design industry providing trade professionals with the inspiration and product information they need to deliver exceptional residential and commercial projects to their clients. Providing detailed design research on products from hundreds of top designer-focused manufacturers, Steelyard is the largest specification platform catering exclusively to the professional design community. With the ability to reach a registered user base of 30K+ interior designers, Steelyard helps manufacturers promote and measure real market demand for their products. Professional interior designers, architects, and corporate buyers can register for free on Steelyard. For more information, visit www.steelyardaccess.com or follow us on social media @steelyardaccess. Wiseguyreports.Com Publish New Market Research Report On-“Luxury Leather Apparels Global Market Sales, Revenue, Price and Gross Margin Forecast to 2022”. The study reveals that Automated Storage and Retrieval System is trending in North America region. In recent times, the mini-load systems are required to extract that grasp handles on vacuums that attach with suction. Additionally, the Robotic arms also play a crucial role in AS/RS mini-loads. The utilizing AS/RS will increase efficiency and throughput, that provide more space, and reduces building costs, will lead to the growth of this market. The study indicates that the AS/RS play one of the important role in meeting the tough demands of logistics operation. It allows to extends order in less times, boosts product security, saves space up to 85% and many more are the factors, expected to favor the growth of the Automated Storage and Retrieval System Market. The study indicates that the warehouse automation systems has configured to be completely redundant, spreading inventory and also reduces the need on the ability of any AS/RS Shuttle to handle a task. The Automated Storage and Retrieval System Market is growing rapidly over 7.7% of CAGR and is expected to reach at USD $~10.81 Billion by the end of forecast period. The Automated Storage and Retrieval System Market has been segmented on the basis of categories, techniques, end -users and region. 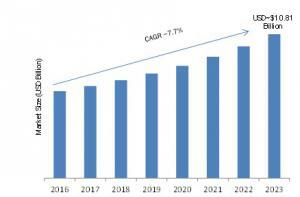 The semiconductor and electronics are expected to propel the highest growth rate during the forecast period as the AS/RS Systems can also easily expanded to meet increasing productivity demands in the North America region. On geographic basis, Automated Storage and Retrieval System market is studied in different regions as Americas, Europe, Asia-Pacific and Rest of world. It has been observed that North America region is leading with largest market share growth in the Automated Storage and Retrieval System market as the trend of e-commerce in the logistics and warehousing industry is growing in these regions. In this market, Europe is to be estimated to be the second largest market share for Automated Storage and Retrieval System solutions during the forecast period. PUNE, INDIA, July 27, 2017 /EINPresswire.com/ — Pune, India, 27th July 2017: WiseGuyReports announced addition of new report, titled “Best Practices in Retail: Smart Fitting Rooms – Fit for the Future”. – Get a detailed understanding of the usage and importance of smart fitting rooms in retail. This report can help you pitch solutions to retailers that include smart fitting room technologies and to gain insight into retailers' priorities and challenges. SAN FRANCISCO, USA, July 26, 2017 /EINPresswire.com/ — According to researchers at Harvard University, all one has to do to tell if a person is likely to succeed is to look at his or her socks. In a study published in the Journal of Consumer Research, “The Red Sneakers Effect: Inferring Status and Competence from Signals of Nonconformity,” researchers took a look a nonconformity and how that related to social status and competency. They concluded that nonconformists such as those who wear “crazy socks”–socks with bright colors and bold patterns–are intentionally signaling that they are not concerned with prevailing social ideas or practices. Though nonconformists can sometimes be characterized as strange or weird by those who conform, nonconformists benefit from their shunning of social norms as they are perceived by those who adhere to societal norms to be more competent and of a higher social status. Dr. Adam Galinsky, a social psychologist from the Northwestern University, conducted a study similar to the “The Red Sneakers Effect.” He arrived at some of the same conclusions as the Harvard researchers before concluding that what a person wears literally affects the way they think, feel and act. David Jason, a spokesman for the sock web site, SockstoBuy.com said he understands why something as simple as a pair of fun dress socks can show nonconformity and affect behavior. “Crazy socks are kind of the modern equivalent to the power tie,” he said. PUNE, INDIA, July 25, 2017 /EINPresswire.com/ — Pune, India, 25 July 2017: WiseGuyReports announced addition of new report, titled “Global Mattress Market: Industry Analysis & Outlook (2017-2021)”. A mattress is a large pad for supporting the reclining body, used as a bed or as part of a bed. Mattresses may consist of a quilted or similarly fastened case, usually of heavy cloth, that contains hair, straw, cotton, foam rubber, etc., or a framework of metal springs. The mattress support layer, also known as its core, includes all the layers below the quilting and comfort layers of a mattress. There are several choices of mattresses available in the market on the basis of material used in it. Mattresses are sold in four standard sizes. Known from smallest to largest as twin, full, queen, and king size, the queen size being the most popular choice. The key factors driving the growth of the mattress market are growing innerspring mattress segment, increasing number of bedrooms, influence of hospitality and real estate, growing online sales, growth in construction sector, rising frequency of home renovation activities and rise of luxury mattress segment. Some noteworthy trends of this industry are preference for customized mattresses, need for multifunctional beds, growing demand for eco-friendly mattresses, and introduction of online bed-in-a-box. However, the expansion of the market is hindered by costs of mattresses, review and rating competition and volatile prices of raw materials. The report “Global Mattress Market” provides a comprehensive study of the global market with detailed analysis of market size, distribution channel and major product segments along with the US and International market. The major trends, growth drivers as well as issues being faced by the industry are being presented in this report. The industry comprises few large players such as Tempur Sealy International Inc., Select Comfort Corporation, Dorel Industries Inc. and Serta Simmons Bedding, LLC. All these companies have been profiled in the present report highlighting their key financials and business strategies for growth. Smart Fabrics and Interactive Textiles market research report provides the newest industry data and industry future trends, allowing you to identify the products and end users driving Revenue growth and profitability. According to MRFR analysis, the Global Textile Chemicals Market size was estimated at USD 9.80 Million in 2016, the market will expand at CAGR of over 3.2% through 2022. Global apparel industry is expected to drive the market over the forecasted period. Increasing demand for technical textile across numerous end-use applications is also expected to be beneficial for the overall market growth. Key Companies in the Textile Chemicals Industry include BASF SE, Zydus Pharmaceuticals Ltd., Medicamen Biotech Ltd., Jiangxi Tianxin Pharmaceutical Co. Ltd., and Koninklijke DSM N.V. among others. BASF SE, Bayer AG, Dow Chemical Company, Huntsman International LLC, Sumitomo Chemicals Co., Ltd., AkzoNobel, Arkema, Kiri Industries, Lubrizol, Omnova Solutions, Pulcra Chemicals, and Sumitomo Chemical. •	The Global Textile Chemicals Market demand was estimated at 9.80 million tons in 2016. •	Apparel dominated the Textile Chemicals market with a market share of in 2016. The Global Textile Chemicals Market is majorly segmented on the basis of Type and Application. •	Based on the Type, the market is segmented into pre-treatment chemicals, furnishing chemicals, colorants, coating chemicals, dyeing & printing chemicals. •	Based on the Application, the market is segmented into home furnishings, apparel, industrial textiles, and technical textiles. Asia Pacific region is expected to maintain its dominance in the global market. Emerging markets of China, japan and India are expected to boost the Asia Pacific Textile Chemicals market. Other emerging markets are North America, Europe and the Middle East countries. Asia Pacific has the largest market share for global Textile Chemicals, followed by Europe and Row. Good qualities are used into technical textile products as compared to their conventional counterparts. Demand for technical apparel is increasing in the U.S. amongst end-use industries such as home furnishings, apparel, industrial textiles, technical textiles the demand for specialty chemicals required for is production has also enlarged. The products comprise wetting agents, emulsifiers, dispersants, detergents, chelating agents, and biocide active ingredients. Growing environment concern regarding the adverse effects of these chemicals may emerge as a major barrier to the overall market development. Contaminated water and water shortages caused by an intensive fabric industry may have extensive local consequences in the manufacturing countries. Stringent environmental regulation such as Integrated Pollution Prevention and Control (IPPC) along with Emission Trading System (ETS) and regulation on registration, evaluation, authorization and restriction of chemicals is expected to hinder growth. Technological improvement coupled with growing clothing demand is allowing manufacturers to offer exceptional marketing points such as stain-resistance, wrinkle-resistance, soft finish and antimicrobial properties to provide enhanced performance and comfort to customers. Moreover, increasing consumer spending towards high quality products especially in Canada and Mexico is anticipated to positively influence the industry over the forecast period. Textile chemicals have the ability to make fabric versatile, stronger, and enhanced their original characteristics. The U.S. textile chemicals industry is driven by the development of technical fabrics, presence of multinational companies and continuous R&D to discover novel textile products. High adoption of advanced technologies and increasing number of manufacturing lines to support the growing clothing demand are some of the factors boosting the industry growth in the region. The Global Textile Dyes Market is expected to witness a significant growth of USD ~ 8.75 Billion by 2023 with CAGR of ~8.13 % between 2016 and 2023. Key players of the Global Textile Dyes Market are Kyung-In Synthetic Corporation (South Korea), Kiri Industries Ltd. (India), Atul Ltd (India), Synthesia, a.s. (Europe), Chromatech Incorporated (US), S.A. Robama (Europe), Avocet Dye & Chemical Co. Ltd (UK), Brand & Performance Textile Specialties (Singapore), LANXESS (Europe), Huntsman International LLC (US), and Others. The textile industry uses various chemicals and dyes during the production of textiles. Likewise, textile dyeing is the process of adding color to textile products such as fibers, wool, silk yarns, and fabrics. There are mainly two category of dye one is natural and other is man-made. Textile Dyes are applied to textile by dyeing from dye solutions and by printing from dye pastes. In addition, Textile Dyes have two main applications i.e. garment dyeing and yarn dyeing. On the other hand, synthetic textile dyes are usually made from coal tar and petroleum. They differ so much because different materials require different chemicals to make the dye adhere. Some types of textile dyes include direct dyes, acid dyes, basic dyes, fiber-reactive dyes, vat dyes, mordant dyes, solvent dyes, disperse dyes¸ and others. Furthermore, the major drivers of textile dyeing markets are large production activity of textile in developing countries. On the other hand, the market growth might be hampered due stringent regulations. WiseGuyReports.Com Publish a New Market Research Report On – “Smart Fabrics and Textiles 2017 Global Market Share,Growth,Trends & Forecast to 2022”. "Smart Fabrics and Textiles are fabrics that have been designed and manufactured to include technologies that provide the wearer with increased functionality. Smart Fabrics and Textiles are defined as textiles that can sense and react via an active control mechanism to environmental conditions or stimuli from mechanical, thermal, chemical, electrical or magnetic sources." This report focuses on the Smart Fabrics and Textiles in Global market, especially in North America, Europe and Asia-Pacific, South America, Middle East and Africa. This report categorizes the market based on manufacturers, regions, type and application. There are 15 Chapters to deeply display the global Smart Fabrics and Textiles market.